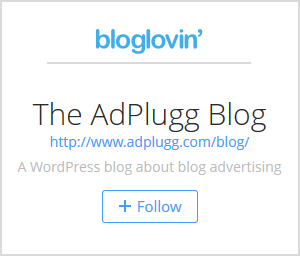 Follow the AdPlugg Blog with Bloglovin! Bloglovin allows you to aggregate all of your blogs into one easy to read feed. No need to regularly check on dozens of blogs, with Bloglovin you will be able to see of the new posts of the blogs that you follow in your feed. Bloglovin also has a really great mobile app that allows you to read your blog feeds anywhere you go. Bored waiting at the laundrymat, DMV or dentist office? Pull up your Bloglovin feed and read up on what’s new with the blogs that you follow. We want to hear from you. Got some tips or comments about Bloglovin? Post them to the comments section below.